The Philippine and Russian navies are in talks for “deeper security cooperation,” which includes the acquisition by the Philippines of submarines. The talks were the highlight of a meeting on July 29 between Vice Adm. Robert Empedrad, Philippine Navy commander, and Adm. Vladimir Ivanovich Korolev, Russian Navy chief, at the Russian Navy Day celebration in St. Petersburg. In a statement released on Saturday by the Philippine Navy Public Affairs Office, spokesperson Jonathan Zaka quoted Korolev as giving his “commitment to support the upgrade program of the Philippine Navy in terms of training, maintenance” and future acquisitions that included submarines. The Philippine Navy delegation, led by Empedrad, also visited Russia’s Admiralty Shipyard, where submarines were being built. 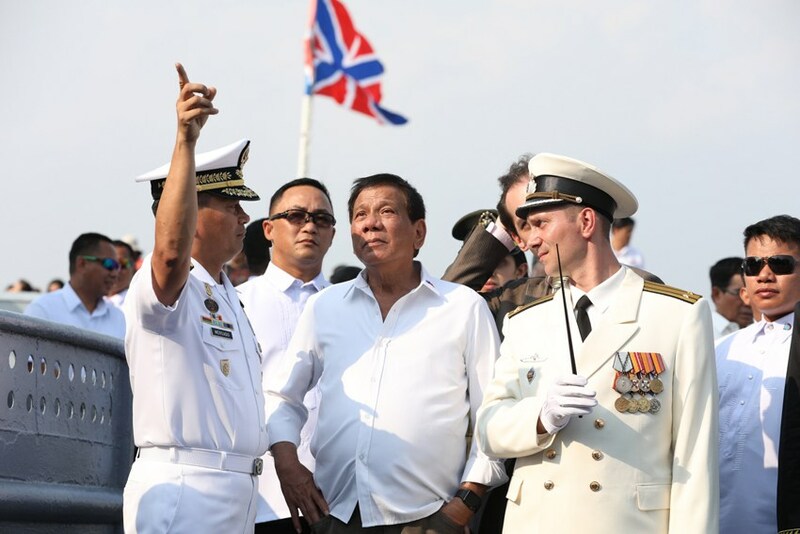 Korolev also brought up the idea of the two navies conducting joint humanitarian assistance and disaster response training, the Philippine Navy statement said. The Russian Navy chief also brought up the possibility of more visits from Russian ships to the Philippines and vice versa. A Philippine Navy ship was expected to make a port call in Vladivostok. Three warships from Russia have made a port call in Manila in June. In attendance at this year’s Russian Navy Day parade was Russian President Vladimir Putin. The Navy chief of China, Vice Adm. Shen Jinlong, was also there. Russia introduced 26 new ships during its parade, meant as a show of strength. Four warships would have Kalibr cruise missiles, Putin said. Kalibr missiles fired from Russian ships in the Mediterranean and the Caspian have been used as part of Moscow’s help for Syrian dictator Bashar Assad. During the parade, Putin reviewed a spectacular annual naval display on Neva River in St. Petersburg with 39 warships carrying out maneuvers.